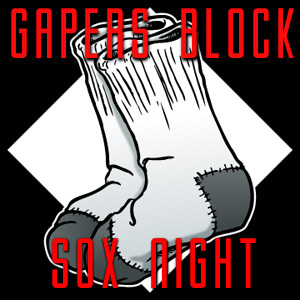 Join Gapers Block for a White Sox Game Sept. 13! Gapers Block is going to the ball game, and you're all invited! Join us to watch the White Sox take on the Detroit Tigers on Thursday, Sept. 13. As a special deal for GB readers, tickets are half-price if you purchase them through this page, by mail using the order form below, or by mentioning the promo code "BLOCK" when you order by phone. * And you're not going to be stuck all in one section -- you've got access to every available section, wherever you can find a spot. Lower deck box seats are just $20, and the nose bleed seats in Upper Reserved are just $7! Hope to see you there! Maybe pick up a Gapers Block t-shirt to wear to the game, too. *Half price ticket offer is good for the Sept. 13 game only.